In my role as a mother, there are at once overwhelming waves of joy mixed with paralyzing fear. Then it’s all topped off with an ambiguous sense of loss. I am besieged with emotions, chores, and, yes, even loneliness if I allow myself to be still long enough. And as with all things in life that move me in this way, I seek meaning in the cracks. So on a cold, rainy October night in New York City, I headed out to see “Motherhood Out Loud” with my friend Sara who is of “advanced maternal age” and is also enduring her own maternal rollercoaster ride. The one thing I must first say about the play is that the acting was excellent. Only four actors (Mary Bacon, Saidah Arrika Ekulona, Randy Graff, and James Lecesne) appeared on stage during the 90-minute show, but more than 20 characters paraded in front of us, telling their stories of triumph and defeat while pledging their solidarity to the state of motherhood. In front of our eyes, they aged and regressed. I laughed out loud often, and I made a tearful sniff twice. Some of the stories stand out more than others. All of them touched on a truth at some level. The most humorous and most relatable sketch for me was one of a mother (played delightfully by Bacon) on the playground with her son, trying to smoke a cigarette and get a grip on how much her life has changed — how much she misses her old life; how she would never in a million years go back to it. She is joined by two other up-tight mothers who plan a playdate in front of her. She tries to participate in the conversation. She fails. She feels awkward and out of place. The acting was so good it made me feel uncomfortable because I have been in that very same spot on the park bench in between those two ladies who I don’t want to be friends with any more than she does, but I often find my need to be a part of something stronger than my introverted sense of disgust with mothers like that. Another speech that blew me away was delivered by the middle-aged mother (played passionately by Ekulona) of a soldier who explains the horror she endures now that her son has gone off to war. She eloquently relates the frantic drone in her ears that comes from constantly listening for a knock on the door, which will be followed by the news no mother can bear to hear. This buzz prevents her from ever being fully present at work, in conversations, in movies, and when she sleeps. Parts of her monologue left me stunned as she described the pain and the fear that comes with the possibility of losing her son, and the sacrifices she was willing to make to ensure he lived. It makes you rethink who the real soldier is. If you enjoy watching actor's transform before your eyes with nothing more than a hooded sweatshirt, an oversized scarf, or a pair of glasses, you won't be dissapointed. Randy Graff goes from young to old and young again as she passes through her characters. She doesn't miss a nuance, and she is unforgettable as a wise, sassy, great grandmother. James Lecesne plays a gay father, and he educates the audience on how to get pregnant, how to maintain a relationship with a surrogate while pregnant, and how family becomes family in an easy, natural, unexpected manner. In a later sketch, he transforms into a divorcee who moves in with his mother and is now taking care of her instead of the other way around. He'll break your heart. The play takes us from the first steps of motherhood all the way to letting go. Some of the jokes were a little predictable, and some of the material hit too close to home to rise above the minutia of motherhood. And both Sara and I found there was one thing missing: The impact of motherhood on the marriage. I don’t know a woman who has not become crazy in one way or another after becoming a mother. I don’t know a woman who did not become unreasonably irritated with her partner on a daily basis while she adjusted. I don’t know of a relationship that didn’t drag on the ground and become a little more frayed by the addition of a child. Sara and I agreed that the greatest change motherhood placed upon us wasn’t just physical and mental. All of our relationships changed. Some for the better. Some for the worst. We would have enjoyed seeing how other marriages and relationships survive motherhood, but that could very well be another play in itself. After the show, Sara and I went for a late dinner, and we discussed the issues the play brought up for us. How hard it is to be a mother, and yet how naturally it comes to us. How it’s the most painful thing anyone could ever do, yet so many of us choose to do it on a daily basis. We sat in a café talking for hours, which is the sign that the play hit its mark. And when the rain finally let up, we walked out onto the streets and practically ran home to where our husbands and sons lay breathing softly in their beds. Waiting just for us. And we were happier women for it. "Motherhood Out Loud" covers 90 years of mothering in 90 minutes. It happens fast. The play. And motherhood. Gather some other moms. Get a sitter. Go. See. It. Directed by Lisa Peterson. Conceived by Susan R. Rose and Joan Stein, and written by Leslie Ayvazian, David Cale, Jessica Goldberg, Beth Henley, Lameece Issaq, Claire LaZebnik, Lisa Loomer, Michele Lowe, Marco Pennette, Theresa Rebeck, Luanne Rice, Annie Weisman and Cheryl L. West. The show runs from October 4th through October 29th with eight shows a week at the 59E59 Theatres. Tickets are available at primarystages.org or call 212-840-9705. For a special Motherhood Later Than Sooner discount, use the code MOM9161. 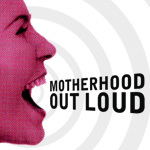 Visit MotherhoodOutLoud.com, for more about the show, and submit your AHA Motherhood Moment to be featured on their site...and see what other moms are sharing. Laura, your review made me ask Robin to see the play again!! We missed you!!!!!! !